I have been building Star Trek Props for about Eleven years now.I am a fan of the original series and create these props from scratch, having spent months of research per item, I create them so that they will be as screen accurate as possible. All of our props are hand made. Assembled one at a time and made to order. They are NOT a toy. They are NOT designed for use out doors or to be manhandled. I have sold these props to a Star Trek Museum in California and to a fan made Trek film crew as well as individuals for their private collections. I have made Trek props used in a wedding. I was told by a person that had been on the original bridge set that the Moire scanner prop is as close as he has ever seen to the original on the set. These all take time to build so I build yours when you order it. Please allow 6 - 8 weeks for shipment after payment has been received. Most of the time I ship sooner than what is listed but due to high orders some of the time, I must still state 6 - 9 weeks. As of February 2013 We have just moved to a new facility with more room to grow. With new equipment we should be able to produce more so our product line should grow. 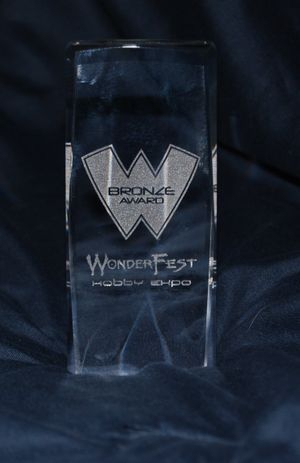 A good Friend of mine purchased a prop from me months ago and unknown to me he entered it into the Wonderfest Prop contest. Out of 743 props judged it came in third place. The Judges were themselves renowned Hollywood prop artists listed below. Colin Cantwell: Known for: 2001, Star Wars legendary ship designer. Joe Alves: Production Designer of JAWS, Close Encounters. I was honored to receive such an award.